Our high tech, state of the art training facilities are located in the Vital Security building. Offering a variety of training, continuing education and permit qualifications. We can even provide classroom training off site at your location! Concealed Carry permit or license! Our goal is to help you get your concealed carry license by giving you all the information you need about training requirements and classes in your state. Every state has different rules and laws when it comes to carrying concealed, and each have different training requirements. 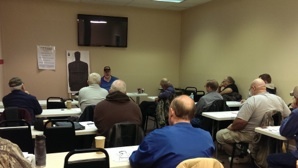 Basic pistol course for the individual who has never shot a pistol before. Learn all the basics and help you to choose which pistol is best for you. You’ll never know when you need it! Recipient chooses the date and time!